George Cruickshanks Fallow was born to Archibald (a grocer and fruit grower) and Margaret (by 1914 a postmistress) in Rosebank near Dalserf, Lanarkshire on the 5th November 1890. In 1905, when Fallow would have been 15 years old, he began an apprenticeship at Mauldslie Castle, on the other side of the River Clyde from Rosebank, spending four years training in the gardens there (described by the Scottish Field in 1904 as having ‘incomparable beauty’ made charming by the combination of art and nature) followed by a year in the glasshouses there as a journeyman. Much of this information is recorded in the Probationer Gardener Registers held in the RBGE Archives, in which Fallow is given glowing references from the Head Gardener, David Bryson, and from his employer, Lord Newlands himself – “he has given every satisfaction wherever he has been and is a young man who wishes to get on and to receive all the scientific training possible. I may add that he is a thoroughly honest, sober, obliging and a first class workman”. 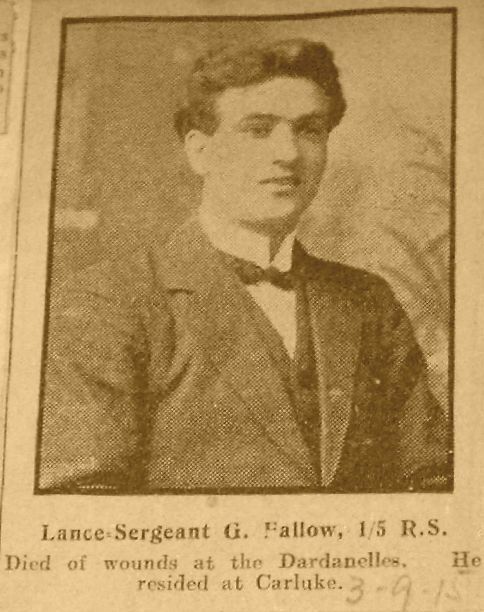 Image of Lance Sergeant George Fallow found in an album of newspaper cuttings held at the Royal Scots Museum at Edinburgh Castle. Moving on from Mauldslie, Fallow spent ten months at Alloa Park before securing a position as a probationer gardener at RBGE on the 4th September 1911. 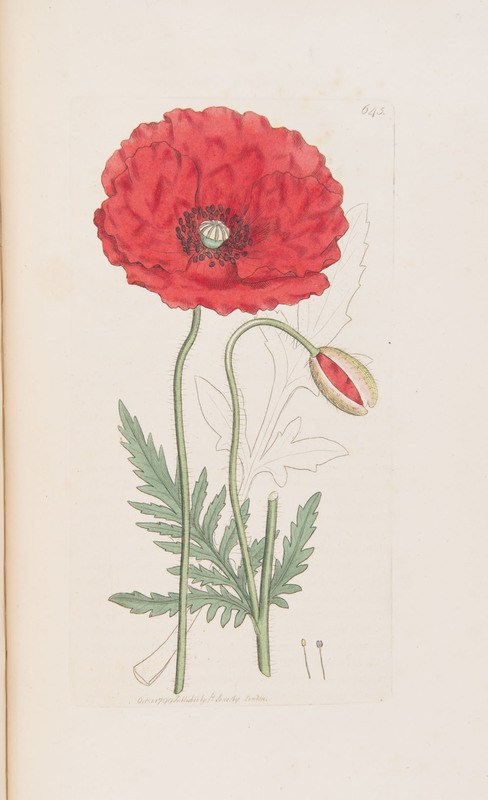 Here he would spend the next three years working six days a week in the Garden during the day and attending lectures and sitting exams in the evening with the aim of leaving RBGE at the end with better job prospects. Fallow seems to have excelled here, getting good marks and impressing the Regius Keeper Isaac Bayley Balfour, which was no mean feat. An occasion where Fallow had stood out was recalled by Harry Bryce, one of his fellow probationers, in the RBGE Guild News Sheet in March 1980: “In July 1914 the Prof [Isaac Bayley Balfour] supervised the arranging of a demonstration of exhibits in the Laboratory… The whole layout was like a cross-section through the field of Botany.” All this was for a surprise oral examination for Balfour the following evening – the probationers would have to study the exhibits in order to talk about any subject Balfour asked them to. After the exam, “the Prof then asked if anyone would volunteer to talk on any of the subjects… only one stood up and that was George Fallow. The following morning George was called up to the Prof’s office.” Balfour had been asked to recommend someone for the post of Sub-Inspector of the Horticulture Branch of the Board of Agriculture and Fisheries in London. Fallow was recommended and selected for the position, leaving RBGE on the 11th July 1914 to take up his new post. So impressive was this achievement it made the local news, being reported in the Hamilton Advertiser on the 1st August. Bryce continues: “Now, George was a member of the Territorials [The ‘Terriers’ were quite an attraction during this time. Apart from the drills and parades there was the big attraction of the Summer Camp] and he decided to go to camp with his fellow students, then after camp he would proceed to his new appointment. Alas, the ‘best laid schemes’…” This was 1914, of course, and Fallow was still at camp on the 4th August when war was declared. The ‘Terriers’ were immediately put on active service training rather than return to their jobs, Fallow enlisting in the 5th Battalion of the Royal Scots (the Queen’s Edinburgh Rifles). 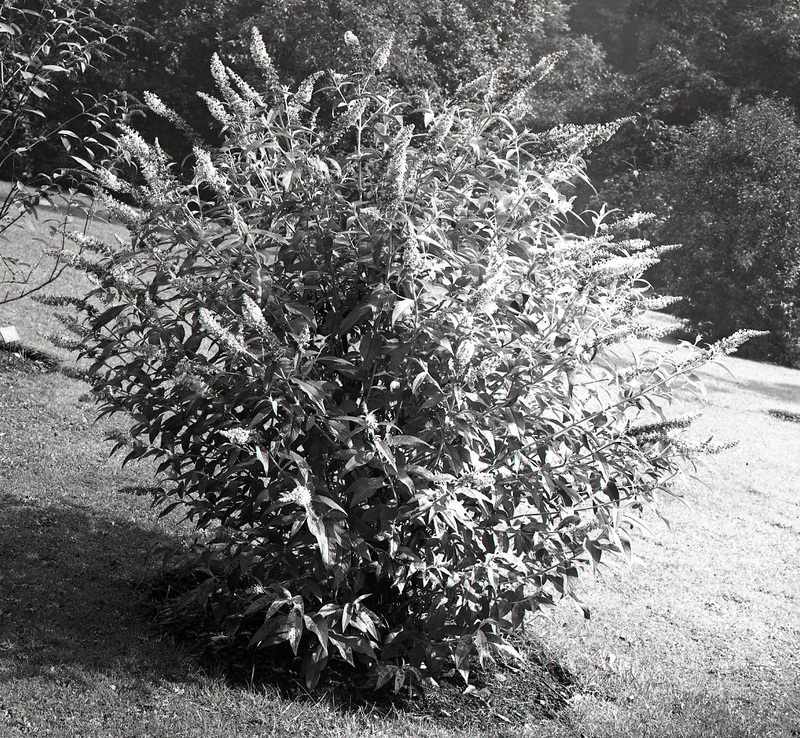 Buddleia fallowiana in flower at RBGE in 1928, from our glass plate negative collection. After an initial period of training, Fallow and the 5th Royal Scots were dispatched to Gallipoli, landing there on the 25th April 1915. Some of what these men went through there has been outlined a few times already in previous Botanics Stories dedicated to the memory of Fallow’s colleagues William G. Dickson, Duncan Smith and Walter H. Morland, which can be found by clicking here. We don’t know how many of the Gallipoli campaigns Fallow was involved in, nor how long he was in Gallipoli for. We do know that at some point Fallow was wounded, the circumstances as yet unknown. Fallow was sent on a hospital ship back to the base in Egypt, but he died as a result of his wounds on the 19th August 1915 and was buried at the Port Said War Memorial Cemetery near Cairo. 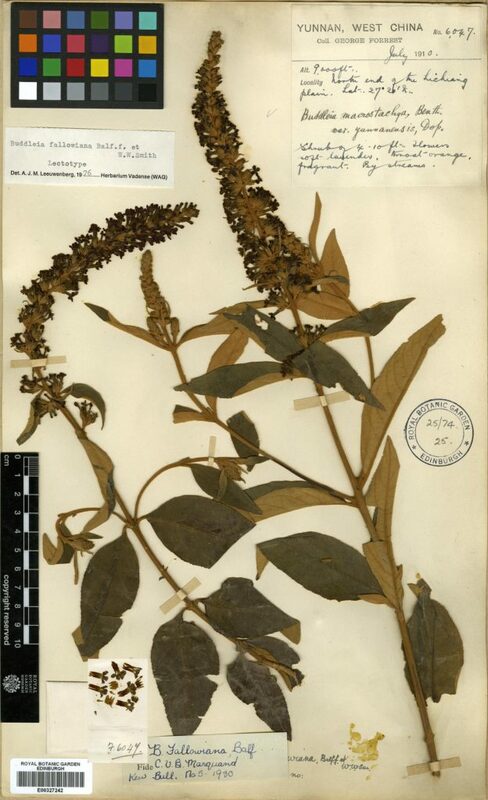 One of George Forrest’s Buddleia fallowiana herbarium specimens, this one collected north of Lijiang, Yunnan, in July 1910. Perhaps now is a good time to name other members of RBGE staff who enlisted in the Royal Scots and other regiments and who also served in Gallipoli, but who survived that experience, going on to fight in other theatres of war, such as William Dykes, Horace Ellwood, James Maxwell Hampson, Henry Johnstone, Charles Lamont, Alexander McCutcheon, John Mathieson Brown and John McMillan Lugton. These names can all be found on our Roll of Honour, accessible by clicking here. It bears repeating (there has been a previous Botanics Story on this subject) that naming this plant after Fallow has certainly kept him in memory, but it also serves as a reminder to us that there are undoubtedly many, many more men, a good example being probationer gardeners, here for periods of three years before moving on, who have been closely associated with RBGE, and have contributed greatly to the organisation, who enlisted in the Forces but are un-named in our records. I only wish it were possible to add these names to the Roll now. With thanks again for genealogical information provided by Garry Ketchen that allowed me to expand upon what I have previously been able to say about George Fallow, to mauldslie.org for the information about Mauldslie Castle and to the staff of the Royal Scots Museum at Edinburgh Castle for help with my search for RBGE staff in their newspaper clippings albums, and permission to use the images found.